A Monthly Review of the Occult Sciences and Metaphysical Philosophy / Devoted to Science, Psychology, Art, Literature, Philosophy, Metaphysics, Thought-Transference, and Mental Phenomena / Devoted to Science, Psychology, Philosophy, Metaphysics and Occult Subjects. 1/1, January 1895-1897. Continued under a variety of names until 1913. 80 pp. (varies), 6 x 9. $2.00 a year. The advertisements for the journal called it "the pioneer of Occult and Metaphysical publications," and modestly suggested that "to be without it is to be behind the age." Whipple (1848-1916) was a proponent of what he called "mental science" and the founder of the American School of Metaphysics ("The Deepest Occult Scholars and philosophical minds praise this system as the only complete and comprehensive system yet offered to the public."). The formula he employed in the journal was obviously a successful one and it seems to have thrived until 1913. 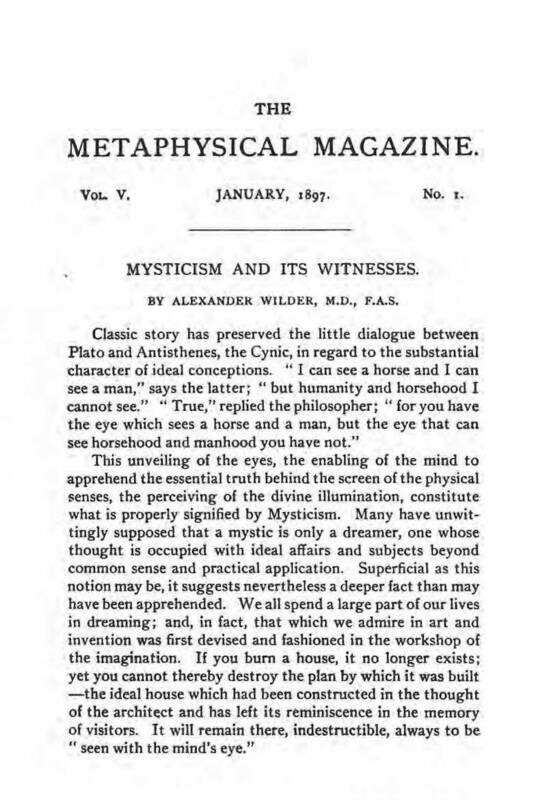 The journal attracted articles by Alexander Wilder (notably an article on "The Rosicrucian Brotherhood" in June 1896), Paul Tyner, Elliott Coues, Henry Wood, H. Stanley Redgrove, E.H. Randle, W.J. Colville, C. Staniland Wake, John Hazelrigg (the astrologer), Maria Corelli, Florence Huntley, et al. Many of the articles appearing here later appeared in translation in Neue Metaphysische Rundschau. Regular advertisements for the works of Paul Tyner, P.B. Randolph, F.B. Dowd, et al. NYPL; ZDB: Freiburg Inst Grenzgeb Psychol. ; INTA archives; LOC.